It was a mounds-of-dishes-from-the-night-before-that-I-was-too-tired-to-clean-because-the-dishwasher-was-full-of-clean-dishes-that-I-didn't-want-to-put-away-either type of morning. Fast forward 8 hours of a crazy work day, and those same dishes were still there. Amazing. I was done working for the day, so I rolled up my sleeves, turned up some music, and got to cleaning. I stepped back to admire my sparkling kitchen and thought to myself, "I have all these clean dishes and a counter you could eat off of - why don't I mess it up by making dinner?" *sob* I begrudgingly start grabbing pots and pans, and gathering ingredients. But something happened that always seems to happen to me. In a sort of magical way, messing up the kitchen with food becomes almost therapeutic. It's like playing with food puts me in a good mood (sounds like a country song!). That's probably why I always end up having some sort of dinner made for my family every night, regardless of how my day went. Having a food blog is not only about cooking and coming up with recipes, it's also about photography. If the food doesn't look appetizing, chances are, no one's going to want to make it. I'd say once or twice a week, my family will be eating at the table... behind me while I'm snapping pictures of what they're eating. A lot of times when I'm taking photos of the food we're eating, I have a sense of urgency to hurry so I can sit down with them and enjoy the food at the same time. So, I made this mahogany shrimp last night. I was having one of those days and I just couldn't get the shot that I wanted of it. I'm frustrated and trying to hurry to get the shot and, in the midst of all that frustration, I hear my little sous chef behind me going, "Mm! Mm! *smack, chomp, smack* This is so good! Mm!". I stop, put my camera down, sit down at the table, and smile. Priorities. The photo may not have been a hit with me, but this mahogany shrimp sure was a hit with my family. The mahogany sauce is so good that I'm putting it into my meal rotation possibly weekly. It would be wonderful with chicken and broccoli, too! Make the mahogany sauce. In a small pan, combine the Hoisin sauce, coconut milk, soy sauce, scallions, garlic, and ginger. Bring to just a boil and remove from heat. Set aside. Make the jasmine rice. Bring the water to a boil in a medium sauce pan. Once the water comes to a boil, add the butter. Once the butter is melted, stir in the jasmine rice. Turn the heat down to low, and cover the pan with a tight-fitting lid. Continue to cook over low heat for 20 minutes. Remove the pan from the heat, and allow it to sit for 5 minutes covered. Meanwhile, prepare the shrimp and vegetables. Heat the sesame oil and butter in a large skillet over medium heat. Add the asparagus and cook it for 5 minutes, stirring occasionally. 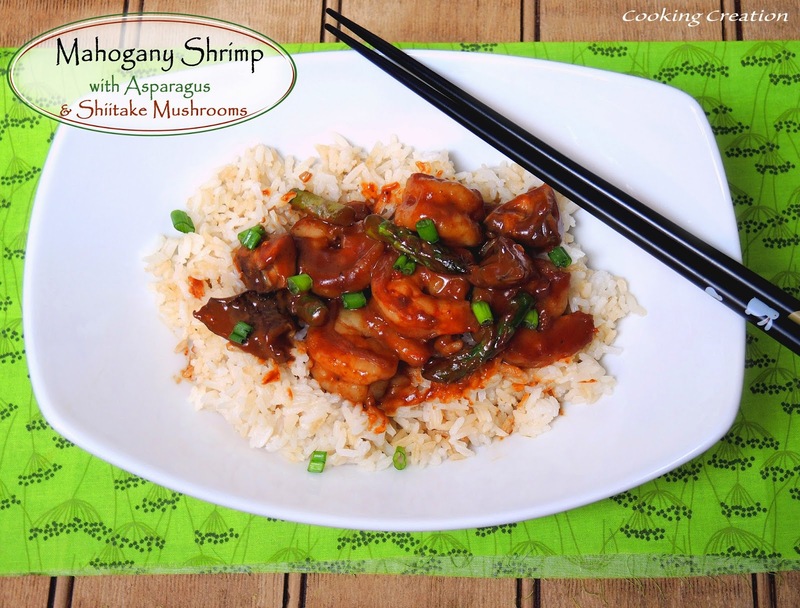 Stir the shiitake mushrooms, soy sauce, and ginger into the skillet and cook for 2 minutes longer. Add the garlic and cook for 30 seconds longer. Add the shrimp to the skillet and cook for 5 minutes, or until the shrimp is cooked through. 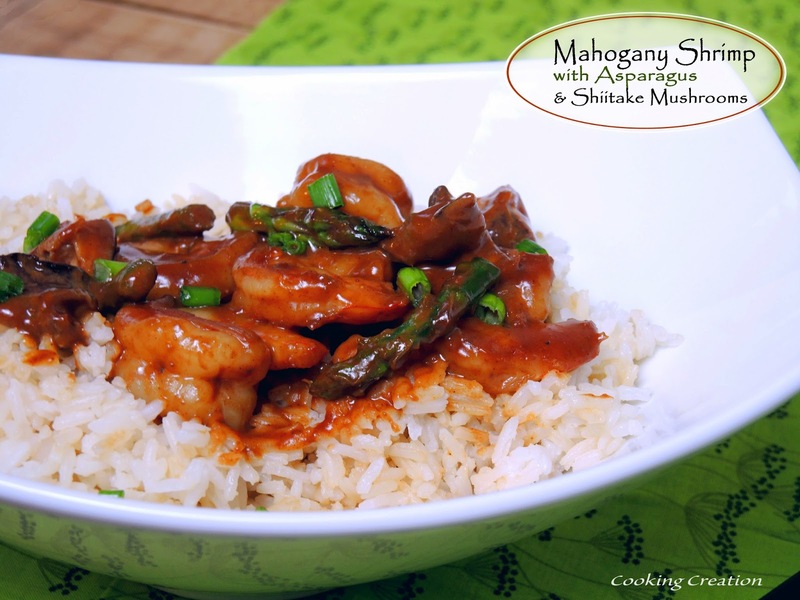 Pour the mahogany sauce over the shrimp mixture and stir well to combine. Fluff the jasmine rice with a fork and stir in the soy sauce. Pour the rice into the bottom of a large serving dish and spoon the shrimp mixture on top. Garnish with scallions.